Can I have some friction in my sharing? I’ve hated the idea of “frictionless sharing” ever since I first saw the Facebook Yahoo! app post to my Facebook wall that I’d read one of their articles (I instantly removed the post, remove the app, and haven’t clicked on a Yahoo! link since). I share the view that I’ve now seen in a number of places – this might be frictionless but it isn’t sharing. At best is automatic visibility. Sharing is something you do when you make a conscious decision that someone else might be interested in something you have to say. It is curation or cultivation of some context that you have filtered out from everything else and decided is worthy of a wider audience. It is making time to make a point (like this blog post perhaps) and making a, hopefully small amount of effort, but still a conscious effort, to pass it on. The use of social media is a performance – it is constructing a view of ourselves that we would like others to see. Most hope that their status will be construed as witty, intelligent, cool or be looking for some reaffirmation from friends or some token of support or validation of their actions … whatever, but the point is that this is all part of someone saying “this is me”. So when I see apps that automatically post that so-and-so has read such-and-such an article, and is listening to this or that, I often wonder if that is part of the image that the person is happy to be presenting. Often it is – but sometimes you wonder why someone is reading a specific article. Of course what is missing is the reaction to the article. Yes I might read an article about something, but did I like it? Did I agree with it? Did it disgust me? When I had to click “Like” to get it listed on Facebook, that would give a clue. When I have to click “share” to post it, I get the option of some context as to why I’m posting it. When the app posts on my behalf, noone has any idea about the context of my reading it and may attempt to draw their own conclusions (most of which will almost certainly be incorrect). I fully subscribe to the idea of people have private thoughts to experiment with ideas and consider a range of options before making up their minds about something. They should be free to follow a range of links about a topic, many they won’t agree with – only then can they get a well-rounded view of it all. But in an age of “frictionless sharing” will people start to think twice before they click on a link or see a film or watch something on TV or listen to that track? Will we slowly breed a society of banal conformity? Well maybe there is hope – it would appear that the idea of automatic posting may be starting to take its course. Yes it might be good for Facebook to decide that telling your friends that you’ve clicked on something will increase their internal hit counts and encourage your friends to click too, which helps their ad business … but it would appear that some are starting to question it too. At last. You used to be able to pick up a book or read an article and keep the knowledge of the activity firmly in your own head. This is a good thing. Lets hope it’s not too late to turn that around. There has been some interesting commentary about the recent (well, a week or so ago now) fad on facebook to change your profile picture to a cartoon character in aid of raising awareness about cruelty to children. 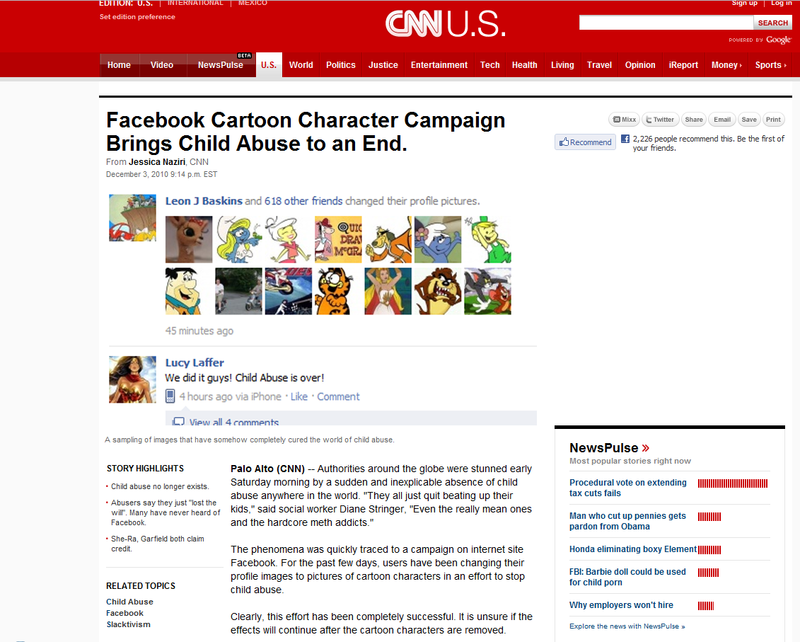 It has led to media coverage, claims it was started by peodophiles, claims that its all a hoax, descriptions as a great example of slacktivism and many parodies, claiming that facebook has solved child abuse (including this CNN parody pic). It does appear to have increased traffic to the NSPCC website and caused an upsurge in donations, so by what measure do you measure a hoax and increased awareness? Ok, so maybe the vast majority of people did nothing more than just change their profile picture, but maybe a small number of them did actually donate. And maybe more will remember the issue when its comes to thinking about supporting a cause in the future. Who knows. The NSPCC did acknowledged the support from the campaign via its own facebook page. Regardless of your views on this particular campaign, it cannot be denied that if a cause like this catches peoples imaginations, it can spread very quickly. Slacktivism or not, social media can amplify significantly. Got a link to this story this morning. An interesting read. Some kid managed to rack up £900 worth of credit card bill playing Farmville, oh well, it had to happen sooner or later. Nothing more to say about that, the mum seems very pragmatic about the whole thing. At least he didn’t buy a car on ebay. What I found astounding though, is some of the comments to the post. I scanned to about half-way down and just had to stop reading. Most were saying ‘hey, you can’t blame anyone else, bad parenting is the cause!’. Well, really, have any of these people ever seen a 12 year old or actually played these games? Yes its stealing, and it sounds like there have been sanctions, but to say things like ‘I don’t think any 12 year old should have a mobile phone … all that stuff should come about between 16 – 18’ and similar comments? Some just don’t seem to have any appreciation of how much social life is conducted via a phone or online these days. When I think of what used to happen when I was growing up – going on trips, courses, holidays, events, whatever and having that low when its all over, and you won’t see anyone to talk about your experiences for a week or so. Not so today. The pictures are on Facebook. They are talking about the trip for weeks on MSN. They are still exchanging texts. Even people who couldn’t come on the trip can participate if someone is posting comments and pictures as they go on Facebook. Its just such a different world. As for those suggesting that she should have had full awareness of what the kid was doing online … well, companies spend a fortune on auditing and monitoring employees behaviours for security. It is not a trivial problem! Yes, you can turn on Parental Controls, yes you can log everything they do … but is anyone really suggesting that any busy mum can only let a child use the Internet when someone is watching or will have time (and the knowledge) to retrospectively examine what they have been up to? Like any new tool or technology, it can be used for good or ill. You can’t police everything a teenager is going to do. All you can possibly hope for is to give them a sense of what is good or bad, safe or unsafe, responsible and not. They will always make their own mistakes, sometimes with extreme results like giving in to the temptation to start spending on a parent’s credit card (but then its not like Farmville actively discourages any spending from anyone!) All you can really hope for is that they learn from their mistakes. And yes, maybe a paper round or doing jobs would be the answer to this specific one (how long would it take to pay back £900 I wonder)! The biggest problem is in providing an addictive game, but when all is said and done that’s essentially Zynga’s business model (as is Runescape, World of Warcraft, and all the rest), to people with no disposable income. But thats a common problem. Everyone has opinions, but some of those shared in the comments to this story are quite scary. You’ve been reading mine. Nod to Tervicz for the link.